Discipline-Based Arts Education (DBAE) - An approach developed by The Getty Center for Education in the Arts, is a framework that insures that all students receive a rigorous study of the arts. It also involves the integration of the arts into any curriculum. This framework has been proven through time and research and should be seriously considered by the new art teacher. DBAE does not have to be taught by an art teacher. It can be taught in a social studies or mathematics classroom. Social studies teachers can teach history using famous works of art. A mathematics teacher can teach geometry using proportional fractions found in the Renaissance. It's a smart move for these teachers to use DBAE because it reaches their visually oriented students and raises test scores. This also works in reverse. The art teacher can collaborate to support curriculum taught by other teachers. Art Production - The creation of art that ranges from wire sculpture to oil painting. 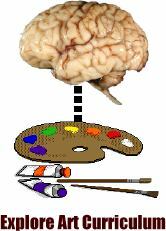 The production of art involves imagination and critical thinking processes. The kinesthetic student is also stimulated because they manipulate art tools and their hands. The production of art can guide us through higher levels of thinking and contemplation of our environment. The production of art can be found everywhere. You can find it on murals in schools, quilts, sidewalks, buildings, and studios. Most importantly, the creation of art is the expression of the heart, mind and hand. Art History - The examination of the contribution artists and art have made to society and culture. Through the study of art history, we begin to understand the mind of great artists and how they responded to events and the culture of their time. We can see how artists were influenced by other art styles and social change. Through art history, we are able to peek into the photo album of time. Art history works hand-in-hand with social studies as it helps us examine historical events through the eyes of an artist. Art history begs the questions of why it was created. How was it used? What was its purpose? Art Criticism - The responding to, interpretation, and critical judgment of specific works of art. The criticism of art can vary from individual to individual. One may love an abstract painting, while another may abhor it. Criticism simply talk about art. The viewer will try to "get inside the head" of the artist. They ask themselves, "What was the artist trying to say?" The audience also looks within themselves and asks why they like or dislike a piece of art. Art criticism involves higher levels of thinking and utilizes several areas of Bloom's Taxonomy. Art criticism can be verbal and written; persuasive writing and interpretation of meaning. Aesthetics - All of us react emotionally to works of art. Art can upset us and make us feel good. Our values and idea of beauty influence what we think about art. When we put our feelings about art into words, it become art criticism. Aesthetics also helps students see what kind of art and design pleases most people. This is helpful to students when decorating their homes and even dress. Critical thinking skills are also used with aesthetics. Discussions such as "Explain why you feel that way," or "How did you come to that conclusion?" may arise. Aesthetics sometimes goes hand-in-hand with art criticism. Assessment - Assessment is also an important component to DBAE. The portfolio is a very effective way to assess the progress of a student through time. When creating a portfolio, a student and teacher should collaborate by setting objectives and criteria. The student and/or teacher selects student work over time and saves it for viewing in a portfolio. At a designated point, the student reflects on each phase of the collection and criticizes their own art. The teacher considers the art and the reflections of the student when coming up with a grade. To make it fair, an art teacher should create rubrics prior to making a judgment. The student should be aware of these rubrics at the beginning of the project. Book: Discipline-Based Art Education: A Curriculum Sampler - This binder is filled with curriculum samplers for use k-12. two for elementary, two for mid-level, and two for high school. Personal Context - It regards students as artists and gives students real choices for responding to their own feelings, ideas, and interested through art. Students do a lot of self-discovery and learning from having control over their subject matter, medium and approach. The pitfall is that some students won't have any ideas or self-motivation. In addition, what does the art teacher do if a student chooses an inappropriate subject? Pedagogical Context - The Choice-based approach supports multiple modes of learning and teaching. The art teacher uses a variety of teaching methods to reach students. Direct, indirect, whole-group, demonstrations, discussions, small groups, and on-on-one teacher/student contact are just a few methods used. The student is taught and encouraged to become coaches and peer tutors and share information with classmates and adults. The pitfall is students may not choose assignments that address the local standards and/or curriculum. They may also ignore art history. Classroom Context - Students construct knowledge and meaning while creating art. Students are exposed to a variety of art concepts in short whole-group instruction. They are encouraged to try something new every week or continue working on one piece. The Choice-based classroom is arranged to hold many resources and materials that facilitate group and independent work. Materials are organized for easy access because choice is an important part of the process. The pitfall is that the teacher must have plenty of supplies around and keep them available to students. There will be a problem if many students choose the same project. Assessment - Teachers use multiple forms of assessment in the Choice-Based approach. Students have ongoing feedback and assessments. Rubrics are negotiated between students and teachers for projects throughout the year. Students and teachers review the rubric upon completion of the art project. Students are also taught self-assessment through journals, statements, presentations and critique sessions. Teachers use these assessments to redirect instruction. Assessments should encourage risk-taking and focus. Students are graded on mastery of set standards rather than receiving letter grades. The pitfall is that more than likely your school requires a letter grade. The teacher must help with time management and help students move forward. IAD has several additional pages about TAB Choice. Also see the TAB essay and poem. Book: Engaging Learners Through Artmaking: Choice-Based Art Education in the Classroom - The heart of this curriculum is to facilitate independent learning in studio centers designed to support student choices in subject matter and media. The authors address theory, instruction, assessment, and advocacy in a user-friendly format that includes color photos of classroom set-ups and student work, sample demonstrations, and reflections on activities. You can get additional resources on the TAB Choice page. Visual Art Curriculum of Saskatchewan, Canada - This PDF has everything you need for your school. First Week Ideas - IAD's page on many ideas your first week as a teacher. Discipline-Based Arts Education - [Archive] A page by the Buffalo Public Schools. Texas Essential Knowledge and Skills for Fine Arts - A great page by the Irving ISD. NTIEVA Curriculum Resources - [Archive] From the North Texas Institute for Educators on the Visual Arts. TAB List Group - Where you can have online discussions about Choice-Based Art Education. The Virtual Classroom - A blog on a middle school Choice-Based Art Room. Middle School Art Curriculum [Archive] - Secondary curriculum documents by the Brownsburg Community School Corporation. Choice-Based Art Education from Pinterest. My Choice-Based Art Room - Carolyn Kinniery's blog. Elementary Level Visual Art - a great page with many resources from Saskatchewan. Use the drop-down menus for art education. National Arts Standards - Also see the National Coalition for Core Art Standards.